Back in theaters, apparently for a limited release prior to the DVD. It's always interesting to see what kind of choices George Clooney makes. I was initially afraid that it was another one of those bad-corporation-and-corrupt-lawyer flicks, but the corporate stuff here is almost a MacGuffin for a terrific character study. And what a cast! 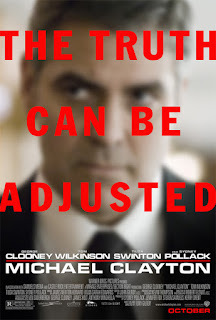 Clooney is rock-solid, of course, but Tom Wilkinson and Tilda Swinton are also terrific, and all three were nominated for Academy Awards. Very entertaining, too, and suspenseful. Not overly intellectual or artsy-fartsy, either, but certainly not light fluff or mindless pap. Check it out!